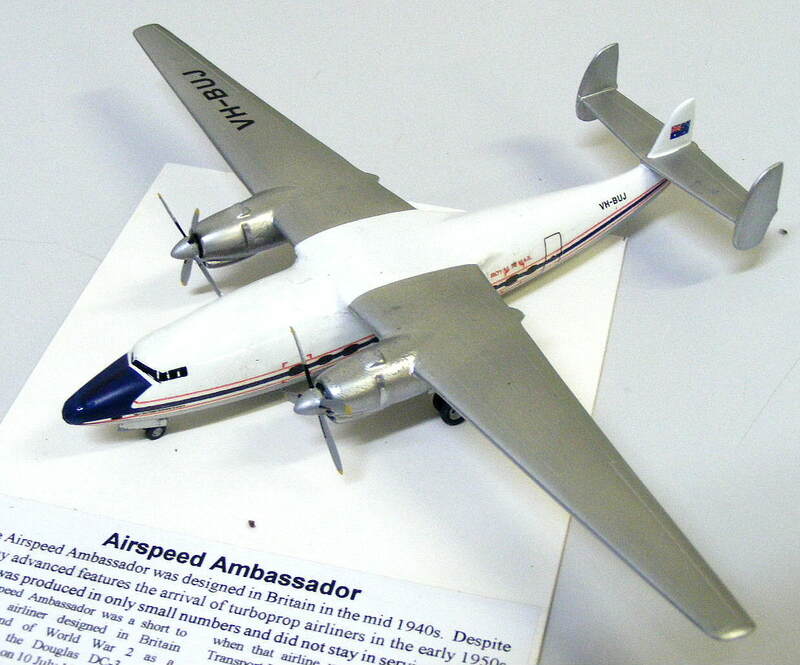 Making the Airspeed Ambassador in 1/144 | The M.o.B. Welsh Models has been around for decades, initially offering kits of airliners in 1/144. These kits were fairly primitive vacform kits with everything for the model on the sheet of vacformed plastic, including tiny details such as the propeller blades. Understandably, these kits were quite difficult to make well. More recently Welsh Models have been offering kits in what is called multi media which makes for a kit that is much easier to put together and gives a range of airliner model kits for fair to middling modellers, such as yours truly. The result is that it is becoming difficult to think of an airliner that is not available in 1/144 from one of the small range of kit manufacturers, and to think of a livery for those airliners that is not available from the growing number of decal makers. When it comes to Australian airlines and airliners the Hawkeye company offers a great many liveries for us to enjoy. The Ambassador is one of those ‘also ran’ airliners that holds a small but interesting place in the history of civil aviation. It was not a bad airliner but it was designed and built in the years leading up to the introduction of turboprop airliners such as the Fokker Friendship. Consequently only a handful were ever made. Also small but interesting is the operation of the Ambassador by Butler Air Transport (BAT) in Australia. 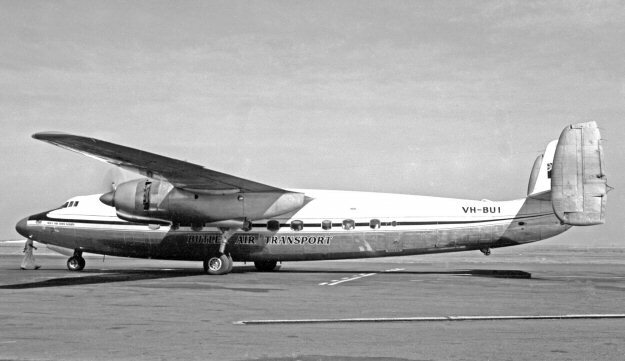 Almost all Ambassadors were owned and flown by British European Airways (calling them Elizabethans) but BAT bought three in 1957 and used them mainly on its network of routes in New South Wales. These services continued until 1959 when BAT was finally bought out by Ansett Transport Industries, and the Ambassadors went back to Britain. I’ve had the Welsh Models 1/144 kit of the Airspeed Ambassador for some time but lacked the decals to make one of the BAT airliners. That was until ‘VH-WAL’ began a thread on the A/CAM group site about constructing an Ambassador out of the old and difficult Transport Wings 1/72 vacform kit. It was quite an adventure. As part of this process he also drew up and printed decals for the BAT Ambassadors for his model. This immediately got my attention so I asked him if it was possible for those decals to be reduced to 1/144 and he referred me on to Hawkeye who will be making the decals publicly available in a while. Not long after a set arrived in the mail for me to play with. Unlike the 1/72 kit that VH-WAL struggled with, the 1/144 Welsh Models kit is simplicity itself. The whole tail unit comes in one intricately moulded resin part and the rest of the airframe comprised two vacformed fuselage halves and two resin wings. The propellers and undercarriage come in white metal. The whole process of making the model was simplicity itself, the decals themselves went on like a dream and the finished model looks very nice. bookmarкed! !, I like your web site!